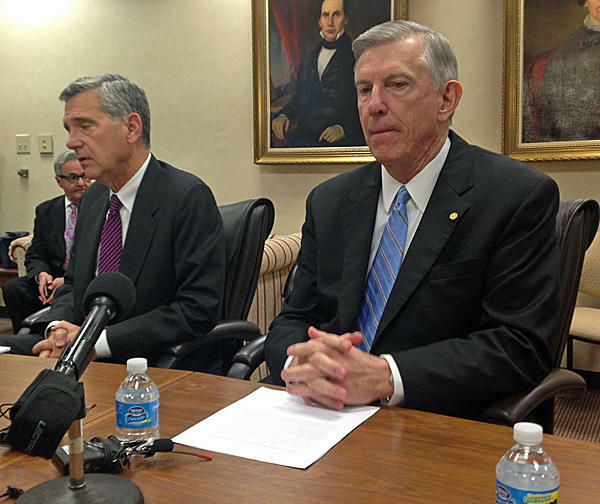 John Fennebresque, left, at the press conference announcing that Ross was leaving his post, at the Board's request. Earlier this year, Fennebresque asked President Tom Ross to step down. That began a search process that eventually drew intense criticism from fellow Republicans on the Board and in the General Assembly. Several Board members, including Greensboro developer Marty Kotis and former state legislator Thom Goolsby, called for him to resign. The UNC president search ended Friday with the hiring of Margaret Spellings. After the final unanimous vote, Fennebresque was clearly emotional. In a release announcing his resignation, Fennebresque called it and “honor and a privilege” to serve on the Board of Governors. “With the search completed, I believe now is the time for a fresh start for our University system and its 17 campuses, as well as for this Board of Governors,” he said. In the same release, fellow Board members – and members of the presidential search committee - praised Fennebresque. “While John Fennebresque and I may have had our differences at times, he truly loves the University of North Carolina and has been a tireless, passionate advocate for it,” Ross said, in a statement. Lou Bisette, Jr. will assume the chairmanship until the Board can elect a new leader. It meets in regular session this Friday.